The entire state of Michigan is going to experience temperatures below zero degrees fahrenheit this week, with windchill expected to be -25. These are deadly temperatures. This fundraiser will provide hotel rooms over night for any individuals or families who have been trespassed (banned) from local shelters and/or who have needs that cannot be met by a shelter. Who I am and where I'm from: My name is Amber Hughson, I am a resident of Ann Arbor who volunteers routinely in local housing related organizations and has relationships with people who are or have been houseless. If you have questions about my identity, you can contact the organization Collective Against White Supremacy. Your relationship to the parties you're raising funds for: I am a fellow community member, connected to people directly through relationships - GoFundMe staff, I am not sure how else to explain what a relationship to a person is. How the funds will be used (be specific as possible): As stated, funds are being used to rent hotel rooms for people who are not housed - this is an emergency given that people are currently sleeping in tents in temperatures below zero. Renting a hotel room involves paying a hotel with money, in exchange for temporary access to a room. If you intend to withdraw the money, how you plan to send the funds to the parties you're raising money for or use the money on their behalf: We are doing a combination of things, one being paying the hotels directly via credit card through online hotel retailers (this can sometimes be cheaper), or going to the hotel with the individual and paying for the hotel with cash (the reasoning for this is to not have volunteers' personal credit card information on file with the hotel). In any case, we are saving receipts and are happy to show them to anyone who inquires (amber.hughson@gmail.com). All donations will go directly to lodging for individuals and families experiencing houselessness. 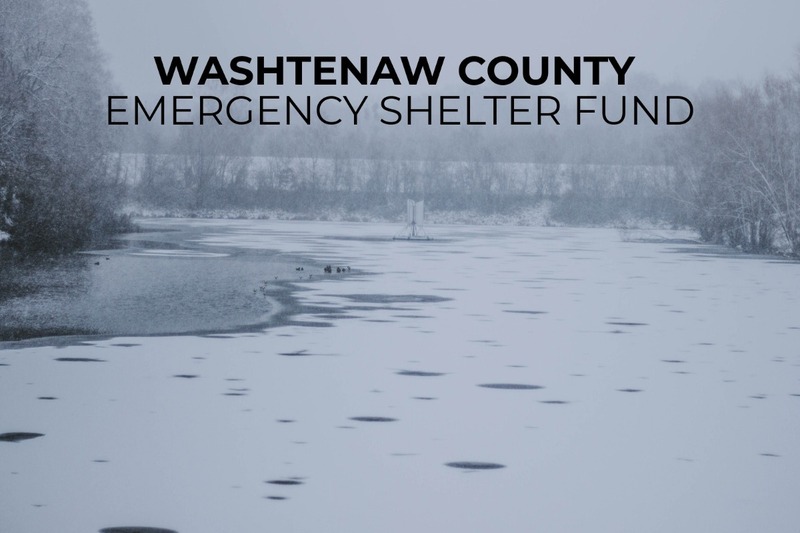 Any remaining donations will go toward supplies for the Washtenaw Daytime Warming Center, once the storm passes. If you or someone you know needs to access these funds, please e-mail amber.hughson@gmail.com and you'll be connected with someone who works in the community and can help arrange lodging. This is for people who otherwise have nowhere else to go, please use any other resources you have before accessing these funds. The Delonis Center (312 W Huron Street, Ann Arbor, MI 48103) offers an overnight warming center for those experiencing homelessness. Shelter is available beginning at 6:30 pm every night between November 12, 2018 and April 1, 2019. There is also onsite dinner provided at 5 pm. The Delonis Center is also providing an option for ensuring homeless individuals throughout the county are able to travel to the warming center after 5 PM and on weekends. Please call 734-662-2829, ext. 238 for transportation to the overnight warming center. During extreme weather there will be additional shelter locations open during the day. The list of locations will be posted on this site and updated regularly. For questions [about winter weather havens or the Delonis Center], email Daniel Kelly: kellyd@washtenaw.org"
Hey everyone - even though it's still just 4 degrees outside today in some places, we're mostly through the polar vortex now. Thank you for your incredible generosity over the last week. We raised a little more than $2,700 (after fees). We spent $1,750 of that on hotel rooms this week, for 16 individuals (one of whom was a baby), and 2 dogs. We also spent $250 on food so people wouldn't have to spend time in the cold trying to get money for food, and a small amount for a child who needed to be seen by a doctor. We have decided to keep what is left in reserve for people who need hotel rooms any time over the rest of winter, or for urgent survival supplies. While this effort was effective at addressing immediate urgent needs, there is a lot of long-term work to be done to address houselessness and economic inequity in Washtenaw County. While there are a lot of government programs addressing houselessness, they are overburdened and the shelters being offered do not meet everyone's needs, because of mental health challenges, pets, substance use, family size, but also people's own dignity, agency, and choice in where and how they live. Long term organizing is needed so that housing is freely accessible to every single person in our county. We urge you to join in supporting any of the organizations who have been doing long-term work in this area. If you do not have facebook, you should be able to access the organizations' websites at those links without an account. Thank you sincerely from the bottom of our hearts, we are so grateful to you and to everyone who volunteered to get people to hotels during this time. We hope to see you at the Warming Center as a volunteer and/or organizing out in the community so that this kind of fund is never needed again. Hey everyone! Thank you so much! A number of people have suggested raising the goal - the issue is that GoFundMe funds take two days to get to the bank and until that happens I am personally fronting the money to pay for the hotels and then getting reimbursed. I only have 1.5 paychecks in my bank account and my rent is due on the first, so I can't currently use all of the money we've raised. I am hoping the money will be in the bank tomorrow, but until then I don't want to raise our ask because it can't be used in a timely way. Right now we've rented rooms for 6 people for somewhere between 1 and 5 nights depending on need. Wow, people have been so generous. Thank you. It costs $50 - $60 / night to house someone in a hotel. We have already used this money for two people, for 3 nights each, who would otherwise be sleeping in tents with only small propane tanks to fight off the cold. So, I've raised the amount we're aiming for, hoping that we can get a few more people into hotels today and tomorrow.